Eight Sri Lankan Universities have medical faculties: Colombo, Sri Jayawardanepura, Jaffna, Galle, Peradeniya, Kelaniya, Batticaloa and Rajarata. The output of all medical schools is around 1200 and they receive the degree MBBS (Bachelor of Medicine and Bachelor of Surgery) . The training period is around five years plus a residency period (Internship) of one year for full registration as a doctor in Sri Lanka Medical Council (SLMC). However, since the intake into government free medical faculties are very limited, a large number of students go abroad to get a Medical Degree from a foreign university. 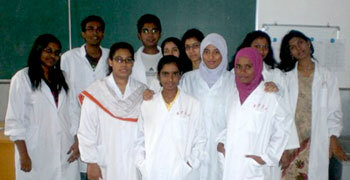 Sri Lankan students study medicine at countries such as Russia, India, China, Nepal, Bangladesh, Pakistan and Latvia. Some also follow medicine in developed countries such as USA, England, Australia and New Zealand where the tuition fees are relatively high. A list of recognized foreign medical schools is maintained by Sri Lanka Medical Council (SLMC). Check SLMC we b site to find whether the University and course you are applying is recognized by them. What is the current tuition and fees? Is this expected to increase yearly? If so, at what rate? You don’t want to apply to schools that are financially out of reach for you. Cost varies with country of education. According to the information provided to us by parents and students, the total cost for entire course in Bangladesh would be around 1-2 million rupees, in China around 5-6 million rupees, in India around 8 – 10 million rupees and in USA/ UK around 40 million. There are rough estimates only. As there is no quality evaluation procedure for foreign universities, clarify information with the present students and with passed out doctors who followed the same course. You can go to the web site of the university and check their facilities, curriculum, assignment procedure, reputation of the lecturers, research publications, laboratories and library facilities and hospital facilities for clinical education. Visit web sites of the various medical schools, and earmark a school that is suitable for you. List of medical schools (or universities with a medical school), sorted by region and country can be found here. Select the country of education based on the cost and the quality of the education. Also look for living standards of the location, cost of living and the personal safety of international students, as this has been a serious issue in some places (eg. some Russian cities). Check whether the clinical sites are in a different location, how to travel, cost for traveling etc. Apart for academic facilities, look for extracurricular facilities (i.e., housing and athletic/ recreational facilities, internet accessibility). Is designated study space available? Are students required to have a laptop? 6. Duration of the course. How many years to complete? Does this involve additional year to learn a new language. Do you have to do internship in that country? Remember that now all foreign graduates have to do one year internship in Sri Lanka after passing ERPM (Act 16) examination conducted by SLMC. It would be better to go to a course conducted in English medium, which would be useful to pass EPRM (ACT 16) examination here. There are various local agents who source students for foreign universities. We are not in a position to recommend anyone. Select an agent carefully. Do not believe in the marketing talk of the agent who is sending the students, but clarify information with other students and parents who have selected the particular medical college. Before paying check the other information with the agent. You may wish to consult relevant embassy or education support institute in the country (such as British council, Russian cultural center) and apply directly. Although the principles of medical practice remain the same, clinical teaching and the relative emphasis on various aspects of training differ from country to country, depending on the pattern of disease prevalence and the facilities and resources available for treating them. Hence after you obtain MBBS or an equivalent degree from a recognized foreign unveristy, you have to pass Examination for Registration to Practice Medicine (ERPM) in Sri Lanka (earlier it was called Act 16) conducted by the Sri Lanka Medical Council (SLMC). You can download the details of this examination from SLMC web site. 10. Do you really want to do medicine? Students study very hard in Sri Lankan to become a doctor, as it is a prestigious job. However if your Z score is not sufficient to enter government free education, then your parents have to spend lots of money and you have to study hard and spend about 5-6 years time in studying this subject. art karala yanna puluwan pathi gana tikk kiyanawada? I got B,C,S results in bio stream. May i apply for MBBS degree course in any foreign university? Pls reply soon related members. Hi im shahan.I have got c and 2s for GCE A/L 2017 is there any university which i can study mbbs? 2 friends of mine went abroad last year.this year i decided to go to the same Uni.nt it tured out SLMC has removed that Uni from SLMC Approved Univ. List..Is there any solution for this issue? And we applied for SLMC recognized uni at China through agent he told us we can register at SLMC with statement of the result bcos Original Certificate will come on first week of November but semister will start before that on September So we paid fees to agent booked our seat at uni and mean time statement of the result came in so we gone to SLMC to register but they told us to come with original certificate and in the mean time my Doughter gone to university to join in now original certificate had come and I had gone to SLMC to register this time they are refusing to register And the reason they are giving is my daughter all ready joined the university. So Any one have idea how can I register my doughter in SLMC. Get a fresh admission letter for upcoming intake ..go with your passport ..simply register . Get MBBS degree from a good university first. In the website of SLMC recognized foreign uni.s, under the qualifications, Guangxi Medical Uni. in China has MD. Bt I want to do MBBS. So will it b a problem . I am doing medicine in China but i could not register in Sri Lankan medical council as my A l results are one C and Two simple passes i am doing my digree well and I am sure that i can get a good results in my medical degree. I really want to serve my country once i finished my digree in china .please let me know whether any way to fill this results gap to get the S L M C registration. i also want to learn mbbs in china. plz give yimfmtion about ur university and fee structure. i have A 1 And 2C passes. Please contact me for personal opinion. Low Fee with Scholarships ..
Can we do the Erpm and not do the internship in Sri Lanka if we prefer? What would happen in that case? Need some answers on this. Please ask this from Sri Lanka Medical Council, or read their website on what are the requirements to become a Doctor in Sri Lanka. Im second year student in yerevan state medical university.it is good university for studying medicine.language is English.beautiful country.if someone finding good university for medicine just contact.buwandakapushpalal85net@gmail.com. This is in which country? I want to study medicine.i have done AL exam again and waiting for results..give me tips to study abroad at low cost.